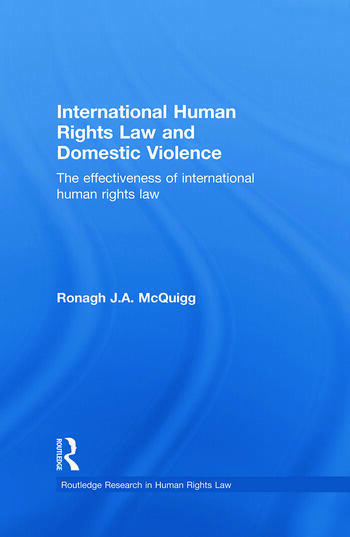 This innovative book examines the effectiveness of international human rights law, through the case study of domestic violence. Domestic violence is an issue that affects vast numbers of women throughout all nations of the world, but as it takes place between private individuals it does not come within the ambit of the traditional interpretation of human rights law. Ronagh J.A. McQuigg questions whether international human rights law can only be effective in a ‘traditional’ case of human rights abuse or whether it can rise to the challenge of being used in relation to issues such as domestic violence. The book focuses primarily on the question of how international human rights law could be used in relation to domestic violence in the United Kingdom. McQuigg considers recent case law from the European Court of Human Rights on domestic violence and whether the UK courts could use the Human Rights Act 1998 to assist victims of domestic violence. The book goes on to look in detail at the statements of the international human rights bodies on domestic violence, with particular focus on those made by the United Nations Committee on the Elimination of Discrimination against Women and the Special Rapporteur on Violence against Women. The book explores the impact that the statements have had so far on the UK government’s policy in relation to domestic violence and discusses how the statements made by the international human rights bodies could be used more effectively by non-governmental organisations, such as human rights groups and women’s groups. Ronagh J.A. McQuigg is a lecturer in the School of Law, Queen’s University Belfast. Her research interests are in the area of the effectiveness of international human rights law, particularly in relation to violence against women.